Our Baby Boutique program was founded to encourage new and expecting moms to follow through with important wellness checkups and attend classes that teach the basics of infant care, including breastfeeding and nutrition. For every pre- and postnatal appointment or class they complete, parents can redeem “Baby Buck Points” at Baby Boutique locations for baby clothes, supplies, children’s books and toys. This innovative program was founded in 2010 as an initiative to encourage new moms to complete their postpartum care, while helping those that struggle to meet their baby’s needs. 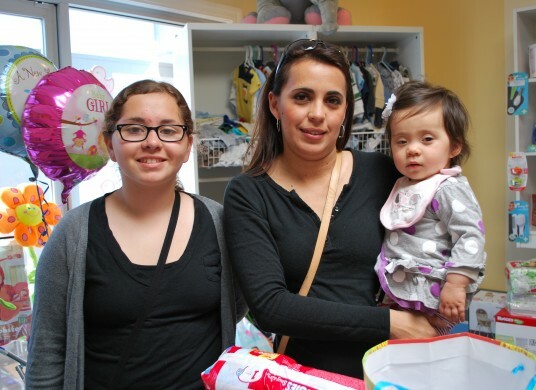 Help support our Baby Boutique through in-kind and monetary donations. 1st Friday: 9:00 a.m. – 12:00 p.m.
2nd Monday: 9:00 a.m. – 12:00 p.m.
3rd Monday: 9:00 a.m. – 12:00 p.m.
4th Thursday: 9:00 a.m. – 12:00 p.m.
1st Wednesday: 9:00 a.m. – 12:00 p.m.
2nd Thursday: 9:00 a.m. – 12:00 p.m.
3rd Tuesday: 9:00 a.m. – 12:00 p.m.
4th Wednesday: 9:00 a.m. – 12:00 p.m.
2nd Wednesday: 9:00 a.m. – 12:00 p.m.
3rd Wednesday: 9:00 a.m. – 12:00 p.m.
1st Thursday: 9:00 a.m. – 12:00 p.m.
4th Tuesday: 9:00 a.m. – 12:00 p.m.
2nd Tuesday: 9:00 a.m. – 12:00 p.m.
3th Thursday: 9:00 a.m. – 12:00 p.m. The Baby Boutique accepts in-kind donations of new or gently used baby items. We encourage those interested to consider hosting a “Baby Shower” where all gifts go to the Baby Boutique. This is a great way to encourage family and friend participation while also donating to this great program! To learn more about this program, or to find out what items can be donated, please call (619) 906-4621. We need your help keeping our Baby Boutiques full of necessary supplies, toys, diapers and more! $2,500 – Tour of Baby Boutique, thank you letter and four complimentary tickets to our Spirit of the Barrio quarterly events. $3,500 – Tour of Baby Boutique, thank you letter, four complimentary tickets to our Spirit of the Barrio quarterly events and a plaque in your honor at a Baby Boutique location. Host your own Baby Boutique drive at your organization! To learn more, please contact Caleb Herrera, Development & Special Events Manager at calebh@fhcsd.org or call (619) 515-2306.